It takes a special person to say that! Is landscaping your yard one of your favorite things to do in the summer? But why is that? Usually, it’s because the summers in Maryland are hot and sticky and any outside work requires a towel to wipe your face. A long with being a tree trimming service in Frederick Md, we also encourage our customers to place mulch around their trees. This adds an extra layer to the trees in a variety of ways. By doing so, you are maximizing moisture, so if you have a couple of weeks without rain, your trees will still have the ability to pull moisture form the ground and out of the air (humidity) to absorb into the mulch. This also allows the roots to be insulate and protect themselves from animals, string trimmers, lawnmowers, and other machinery that could potentially damage the roots or the base of the tree. Lastly, mulch keep the tree and its roots a little warmer through cold Maryland winters and cooler in the hot summers! Another well-known reason for providing mulch around your trees is for the aesthetic value. What’s more pleasing to the eye than a freshly edged mulch ring? It adds curb appeal and ensures your flowers to bloom yearly as the mulch holds moisture that the new seedlings will use to mature. Your yard will have a very vibrant look to it as it will look manicured and fresh every fall and spring! Does having to get too close to trees while mowing make you uncomfortable? If so, add this to another plus to laying mulch around the base of the trees in a ring fashion. This makes lawn mowing easier as you will eliminate the concern of nicking trees and roots with the trimmer or by running over them with the rider or push lawn mower. 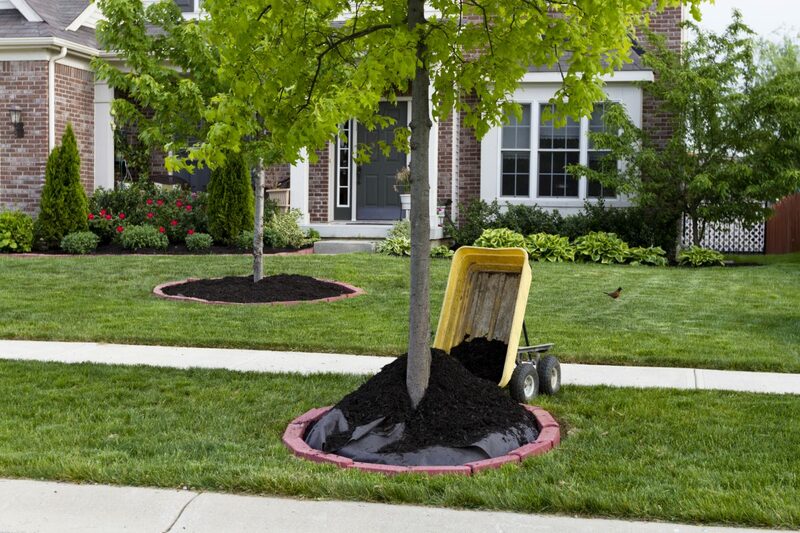 The mulch will allow you to mow right next to it without harming the tree or your mowing equipment. Ever been in a yard with large trees that produce significant foliage? Well the areas around the trunk is in the shade much of the day. Without the sun to shine on grass seed, you get very thin grass or none at all. This looks terrible. It also causes a cloud of dust when you are mowing. If you or anyone in your family has allergies, all the dust in the air can trigger an attack. By adding mulch, you are eliminating the shade issue as well as decreasing the amount of dust which kicks up with mowing. Why Should I Add A Mulch Ring For My Trees? One of the most critical reasons to use mulch in your yard is to help your trees thrive. Mulch helps protect the trees, and with the environment in a sharp decline (more on that later), all trees need help growing and standing firm. Mulch radiates a beautifully manicured lawn for pleasure viewing and keeping up with the Jones. At AxeTreePros its all about providing sound practices to enhance the longevity of your trees and shrubberies thereof. Our tree trimming service in Frederick Md believes the best way to maintain lively vegetation is to exercise simple consistent practices to give your property the TLC it deserves.